Posted on July 20, 2015 by Who Said That? As we drove home, wet from the rain, he told me he felt bad that I sat on the bank while he fished. He wondered why I didn’t join him. “I didn’t mind,” I said. “I was cold and damp and it was good to sit under the tree for a bit.” I couldn’t find the words to tell my son that watching him in this place, as his line danced over the water, was more than I could ever have needed in that moment. 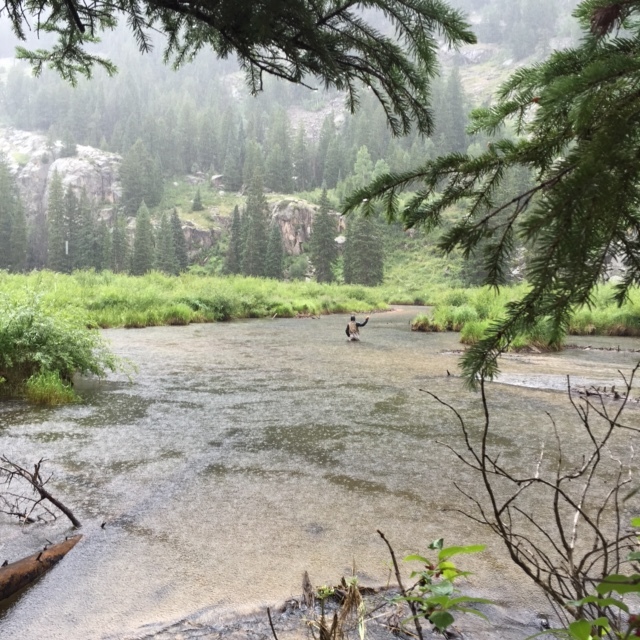 This entry was posted in Family, Life, Parenting, Things I Agree With, Tilting Toward Balance and tagged Anglers, Beauty, Colorado, Fly Fishing, Love, Minturn, Mothers and Sons, Parenting, Rivers, Vail by Who Said That?. Bookmark the permalink. Ah, so now you understand why Harriet just likes to sit and watch her son.